Just a quick up date post. Please note. I took pictures of the room at the moment in time. You will see some pretty updates along with real life in this room too. I did not want to take the time to clean up tools etc. as we are still in the midst of re doing this space. 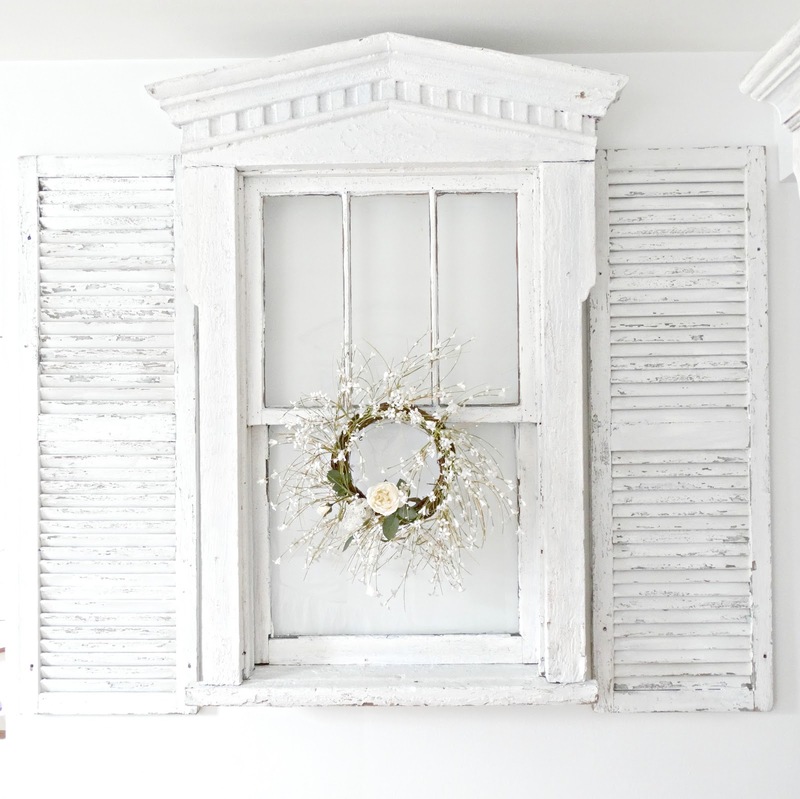 This is my old farm house window and shutters that I had on the long wall of my living room. It was really the only wall in this small room that was large enough to accommodate these pieces. With the new switch up in progress, I thought hmmm what if that window could fit in the actual window of the living room. I thought oh Terry is going to love this crazy idea when I tell him!!!! Well guess what? With a few minor adjustments this window was able to fit. I still have the other window behind this. It just fit perfect in the opening. Now the vintage farmhouse window has a new place in the room and does not take up my precious wall space. Another good thing is I can open the window behind the farmhouse window if need be! Any kind of window opening will not be happening anytime soon here. Below zero temps for us right now. Just glad to know I can open up the window if I need too. The walls and ceiling are painted. I am on the hunt for new drapes. I am trying really hard to have patience waiting for my new Pottery Barn Sectional to come in. The door/mirror Terry made is now ready to find a place in this room. I love that I can still have my door/mirror and we could use the extra pieces to frame out this door way. My sweet TV armoire found on Offer Up is painted and awaiting a new TV and some pretty decor above it. This is where I am at with the living room / dining area up dates. I cannot wait for the sectional. I also have a little fun surprise to show you soon on making space work with a round table in a corner!!!! I am thinking of getting that light film you can put on windows to let light in but gives you some privacy. This window faces my neighbors and at night I would like to have a little privacy. 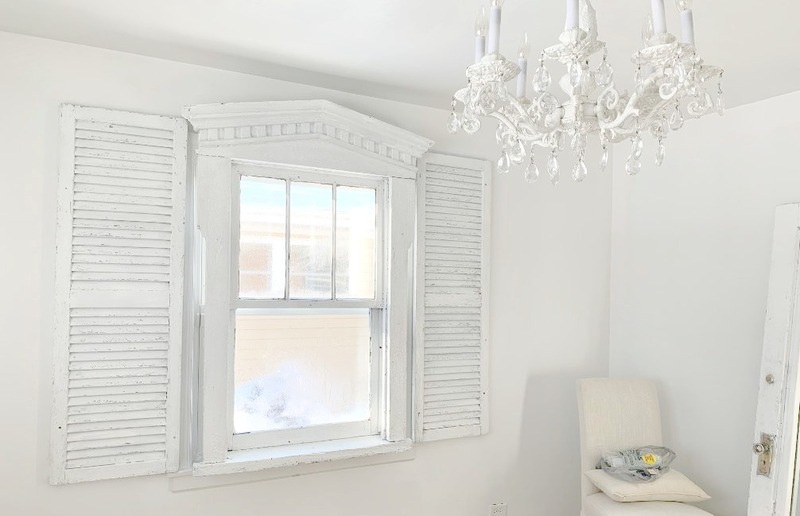 I just do not want to lose the character of this window by putting drapes or blinds on the window. Have any of you used this film for windows and how did you like it? 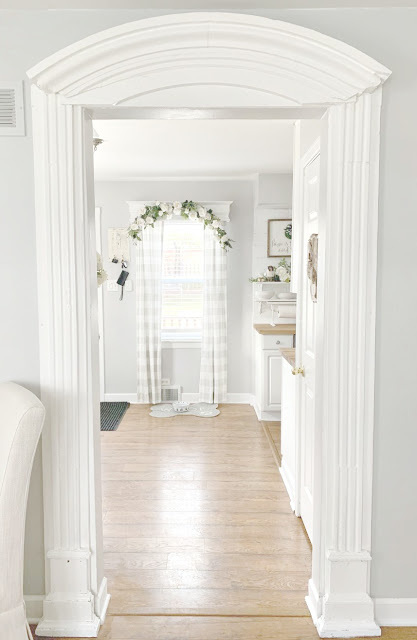 Hope you are enjoying these small steps I am posting as we get to the final reveal of the living room and dining room. Patience is the name of the game and that is not my strong suit!! Loved seeing the sun today as our temps here in Chicago are at extreme lows. Have a good Friday and wonderful weekend. Terry works magic with your ideas and fabulous finds. That window makes the room as do the details around the door. Junk Chic Cottage certainly lives up to its name. Kris, I love, love, love these changes! Like you, I'm anxiously awaiting that new sofa! :-) Everything is looking so pretty and how awesome that Terry was able to make the window fit the window...looks perfect! I really do love that paint color. I've thought about that film for our windows upstairs. Hope you have a great weekend! Love and hugs!! I love that the window fit in front of the original one! What good luck that was! We just had to buy a new tv too. They've changed a lot since we bought our last one. I haven't used the film for a window, but I'm curious to see what other commenters say. I've thought about using it a lot. We currently have solar screens on ours, but it obstructs the view and I'd like to try something different. Stay warm! My kids have the window film on their LR windows. If you're outside looking in after dark you can't even tell that a light is on inside - just looks like no one is home. Ok good to know. Thanks so much. I have seen the pretty patterns at Lowes and Home Depot but have never used this. I just do not want to distract with drapes or blinds behind the window. The focal point is so pretty with just the window. Thanks for letting me know that your kids have used this and like it. WOW Kris you and Terry hit a grand slam. 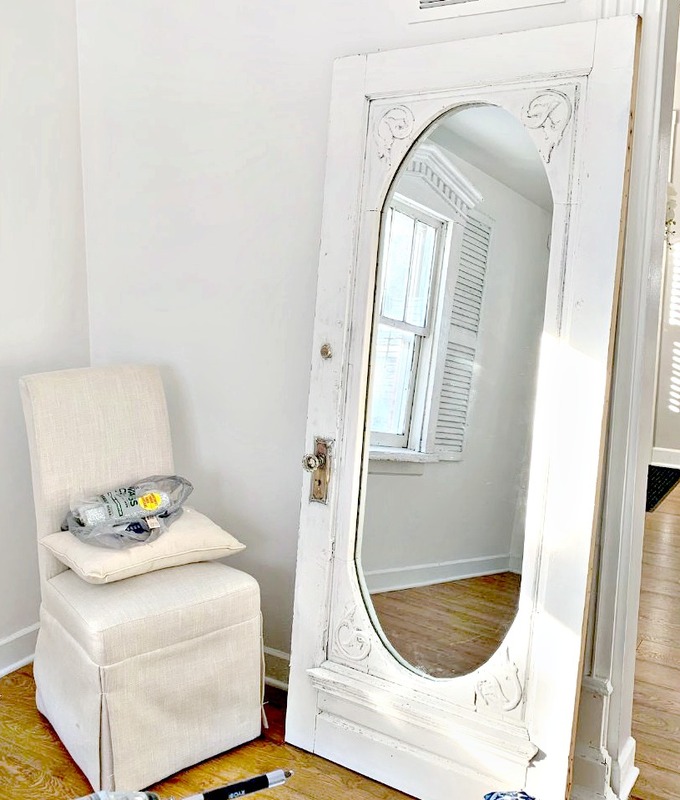 I love what Terry did with the window and the door with the mirror. Terry needs to fly out and teach John a few of these tricks. I'm swooning. Great that you can open the window too. We used the film in our first home for the same reason years ago. It worked great and I bet it's better now. We did ours 29 years ago. WOW, how lucky that the window fit right inside the existing window....it looks amazing!!! The room is really coming together. It is super cold here too and we don't have any sunshine. Oh Kris, I could never embark on home projects and have them all turn into a vision of loveliness like you do! Your personal style is awesome! So happy that window fit and it's perfect. And that door/mirror, incredible! You and Terry are quite a decorating team! I have never used that film, Kris, but have seen it on several homes. I LOVE how that window turned out and that Terry was able to work his magic to make your idea work. For a small space you do make it live big. Wow, what luck the window fit! I love it! You have me wondering about the round table in the corner....what are you up to? GOOD MORNING! It's so nice to have a Saturday morning when I can relax and visit with you dear Kris. 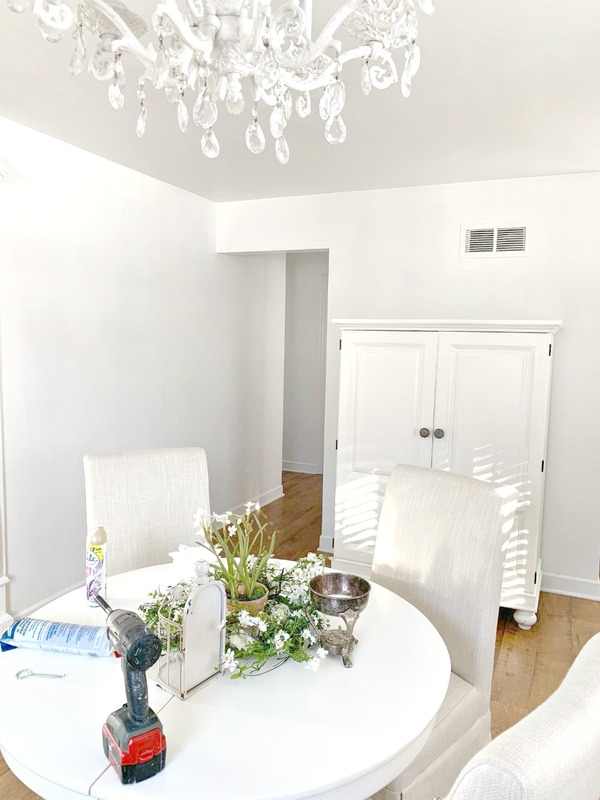 You are inspiring me to do a few before/after pics of my own home that I never share, and to post them on my blog where I truly have dedicated to NOT show my home. Why not, huh? Terry sure knows how to tweak things to match your fabulous ideas. This is GREAT! You two are amazing. I think we have to nickname Terry the miracle worker! Your room has been converted to what feels more like an older farmhouse now which is amazing. Waiting for furniture can be difficult but getting what you want the way you want is the ultimate payoff! Since you ordered the sofa from PB I wonder if they have some curtains that would work for you. Sometimes these places have nicely chosen complimentary fabrics. I have not used this window film, but really would like to. My windows are so old, and not "antique'y" old, just cheap aluminum old, that surely it couldn't make it worse. I love what you did with the window. That Terry must have the patience of a saint! I never had a husband who would even think of doing any of that for me. You chose well, my friend! Hi Kris - I am now able to comment, as we have got some internet sorted where we are now. I love the new wall colour, it is going to work so well with your new sectional - it will be here before you know it! Your beautiful farmhouse window really couldn't look better - it certainly looks at home there. Both pretty and practical! Also loving the those extra pieces framing the doorway. You certainly do have a talent for spotting this things, which are not only beautiful but unique. Looking forward to seeing the round table in the corner trick! Hugs Gilly x P.S. The idea of using window film is great. Wow! I love the use of these architectural pieces and how they look! Brilliant ideas! How much longer until your sofa arrives? I'm getting impatient too lol! I know your room is going to look fantastic when it's all done! Have a great weekend and stay warm! I love your little updates and feel that people like the being real part of other's blogs. Your window looks gorgeous. I do love incorporating architectural pieces into my decor. When I see your charming home I am sometimes tempted to go neutral! That's s great that you can still open your window. I hope you're staying warm! !5 more inches of snow and sub zero temps! I would love that but know that not everyone does. Beautiful Kris and Terry, just beautiful! I am getting excited to see when it is all done. Stay Warm my friend, this is going to be a hard week on us Midwest folks. Hi Kris. We put the film, from Home Depot on our bathroom window about 3 years ago,as it faces the road. It has a leaf design. I really love it. Still let's all the light in. I would highly recommend it. GOOD MORNING! 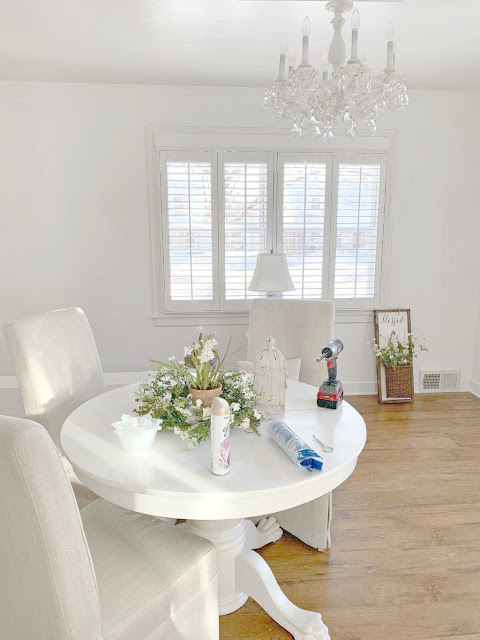 It was wonderful to see your comment today on my blog post...welcome to my old, dingy living room that desperately needs a Kris and Terry touch with white paint! LOL! Oh my friend, the years of blogging have been life-changing, haven't they? I will forever treasure, via memory, the moments we all have shared. I truly "grieve" the absence of a few bloggers who along with me, created some magical moments. But magic never ends; magic continues in various ways and it's engined by the memories left behind. Thank you for your kind, fun and adventurous friendship. LOVE YOU! This is fantastic. What a great idea and Terry is a wiz. I'm sorry about your temperatures. I don't miss the bitter midwestern cold. I can't wait to see it all finished. 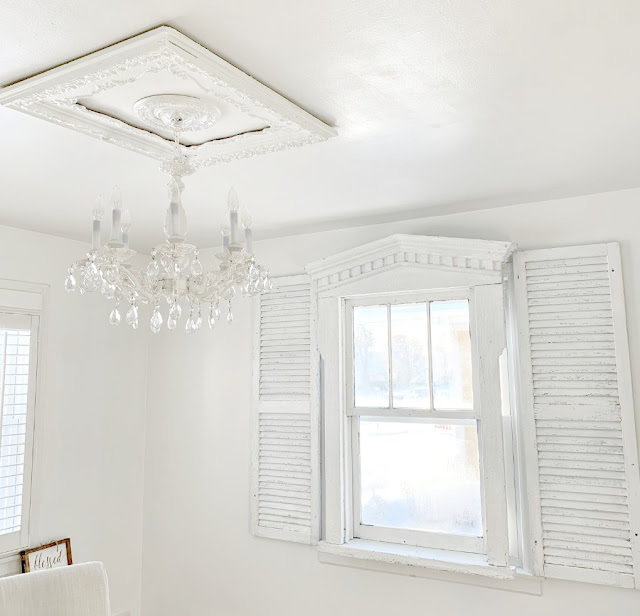 so happy your vintage window worked with your existing window. I remember of thinking to myself when you first mentioned you were considering it, "that will only happen if fireman/handiman husband can make sure the original window can still open" Egress would be a consideration always. LOL I am loving what you are doing so far. Checking back frequently to see how far you've gotten on the room remix. Have a nice Sunday. We have fog today, so I to will be staying in. My projects aren't as pretty, but always something to accomplish. Wow---what a team you and Terry make! I am just loving watching your vision come to fruition! Beautiful....can't wait to see you furniture!